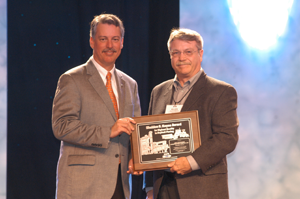 The National Asphalt Pavement Association (NAPA) Quality in Construction Award enhances recognition of exemplary quality hot mix asphalt (HMA) paving throughout the United States. All pavements identified to have achieved exemplary quality will receive recognition for both the contractor and owner. All pavements - roads, highways. airports and commercial - are eligible. The Shaldon G. Hayes Award will be presented to the highest-rated pavement from the previous year's QIC Award program that is a highway pavement using 50,000 or more tons of HMA in the United States. An independent rater will evaluate the finalists. The NAPA Paving Awards are open to all HMA Producers/contractors regardless of membership in NAPA. Firms may nominate more than one paving project for an award. Pavements must be surfaced within the current or preceding calendar year. Journagan Construction Company has also received a number of awards from the Missouri Department of Transportation (MoDOT). Journagan Construction has also recieved a Quality Asphalt Paving Award from the Arkansas Asphalt Pavement Association in 2004 and the Missouri Limestone Producer Association's Hellencamp-Rush Memorial Safety Award in 1998.